“I had the privilege of being invited to attend and speak at the Ahmadiyya Muslim community peace conference in Scotland on Saturday. Not only do they fully contribute to life in Britain, but they raise thousands of pounds each year for British charities. The horrific events of Friday evening in Paris were condemned by all attendees. True Islam is a peace-loving religion and the Ahmadiyyans follow this principle in their daily lives: they believe wholeheartedly in peaceful solutions to all matters”. “It is very sad that in today’s world there is a minority of Muslims intent on presenting an alternative image of Islam. 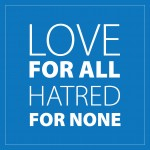 The Ahmadiyyan Muslims wish to promote loyalty, freedom, equality, respect and peace, and the motto they live by is “Love for all, hatred for none. All of us would do well to remember, and try to live by, that motto also”. “A few months ago I had the pleasure of attending the Ahmadiyyan mosque in Morden and I have met on a number of occasions with members of the Ahmadiyya community. The hon. Lady is absolutely right: they are a very good example in terms of not just the values they live by, but the practice—the way in which they put those values into practice in working within their local communities”.